Personalized AmeriTotes with Soft Loop Handle. Hot Stamped Shoppers may be combined for price breaks if the same plate is being used on all sizes of bags. Prices are based on printing of 1 color on 1 side of the bag. Hot stamp pricing as listed is for up to 50 sq. inch size plate. Plate charges will apply. Lead time 5 to 7 weeks. for other printing options call for a quote. Prices per case. To order call us at 1-800-426-5708 or Email at Info@americanretailsupply.com Made in the U.S.A. 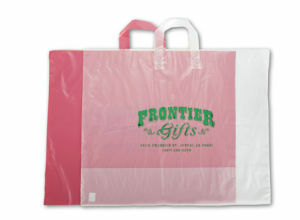 Bag Colors: (0) Clear Frosted, (8) Hot Pink, (2) Purple, (4) Citrus Green, (5) Red. These bags are made with 20% to 25% recycled material consisting of a combination of post industrial and postconsumer resins with a minimum of 5% post consumer recycled (PCR). Bags can also be made with 100% biodegradable film on custom mill runs of 6,000 bags or more. Call for details and pricing. Pricing is for FOB Factory to Continental US only.